One night after a Texas Rangers game I passed a gas station with a bold sign with a red habanero pepper announcing: Habaneros, Taco Revolution. Several weeks later I returned to find out what the revolt was all about. The weekday lunch crowd was active with people stopping by just for the tacos which is always a good sign. I found plenty of graphics and promotional signage inside the taqueria. Someone spent some good money at Kinkos giving Habaneros a professional, almost fast-food chain look. Fortunately, the staff didn’t consist of teenagers asking if I wanted fries with my order. The place heavily promoted their Baja fish tacos on a banner dangling over the counter and outside on the roadside gas prices sign. I decided to try their fish tacos another day; though, I should’ve given it a try after reading some of the positive reviews on Yelp. Instead I opted for a beef fajita, chicken fajita, barbacoa, and something called “The Revolution” all on corn tortillas with cilantro and onions. The tortillas are a white corn full of meat with just a small amount of onions and almost no cilantro. The beef and chicken fajita tacos were okay. They lacked flavor. The barbacoa taco wasn’t bad, better than the average gas station barbacoa which is usually too slimy and flavorless. Habanero’s barbacoa was a little wet with perfect texture and just a little bit of fat. Unfortunately, the flavor was also bland like the fajita tacos. 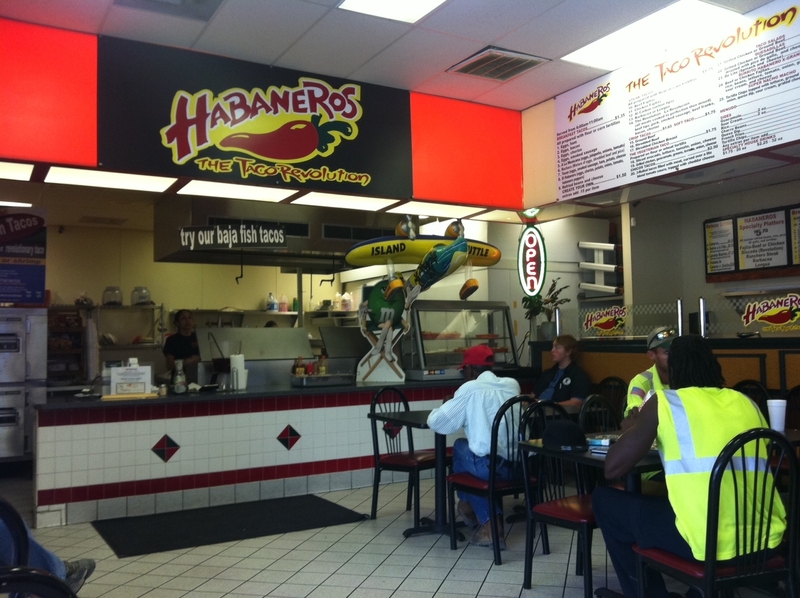 Habaneros is an average choice with one exception, possibly two if the Baja fish taco is as good as several Yelpers say. I’ll definitely be back to try the Baja fish taco and while I’m ashamed to admit it, I’ll also be back to order The Revolution again.